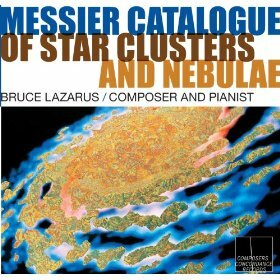 These five pieces form a complete concert suite from Musical Explorations of the Messier Catalogue of Star Clusters and Nebulae, a series of fourteen piano compositions based on the life work of French astronomer Charles Messier (1730-1817). Messier compiled a list of approximately 110 diffuse objects in the night sky, objects which are now known as nebulae, star clusters, galaxies, and immense patches of interstellar gas. The resulting Messier Catalogue is still in common use today. Recent Hubble telescope photos of Messier objects reveal vistas of extraordinary beauty and also great variation in energy patterning – spiraling, floating, exploding, diffusing – which suggest musical variations in rhythm, texture, formal design, and melodic elements. For a more complete description of the Messier pieces, please visit galacticinquirer.net for Lazarus’ article on the cycle, and BruceLazarusComposer.com. A complete album of the cycle, performed by the composer, is available as comcon0014, with distribution by Naxos, at iTunes, Amazon, Classical Archives, and other venues.